Was Virginia Woolf a foodie? Ahead of her time in many ways, she wrote about the importance of giving women more equality, and was one of the first modern writers to write about food. Virginia Woolf defied the conventions of the time, and described the "soles and partridges and potatoes", the food served at a luncheon, in A Room of One's Own. At the very least, she appreciated the benefits of eating well, of "a good dinner". 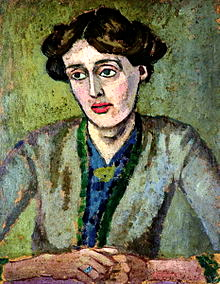 Do you think Virginia Woolf would be a vegetarian, or even a vegan, if she lived in the present day? I think maybe she would be. Even if you're not vegetarian, the dish below is quick and easy to make. I think it would've pleased discerning Virginia Woolf. 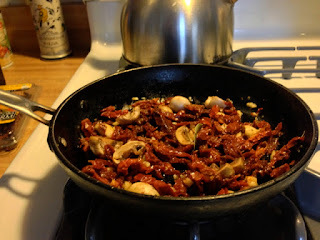 In a small pan, cook two cloves of minced garlic in about a tablespoon and a half of olive oil for a couple of minutes, then add the sliced mushrooms, an ounce or so of sun-dried tomatoes (which need to soak beforehand in warm water for 15 minutes), about 1/4 cup of water (or red wine), and generous sprinkles of oregano. Of course, you could also use basil instead of or in addition to the oregano, and add pepper, too, if desired. (I have a lot of organic oregano right now from my garden so I used that.) Cook for about 25 minutes over a low flame on the stovetop, stirring occasionally. While this mixture is cooking, cook the pasta according to directions on package, for about 10 minutes, then drain in a colander. 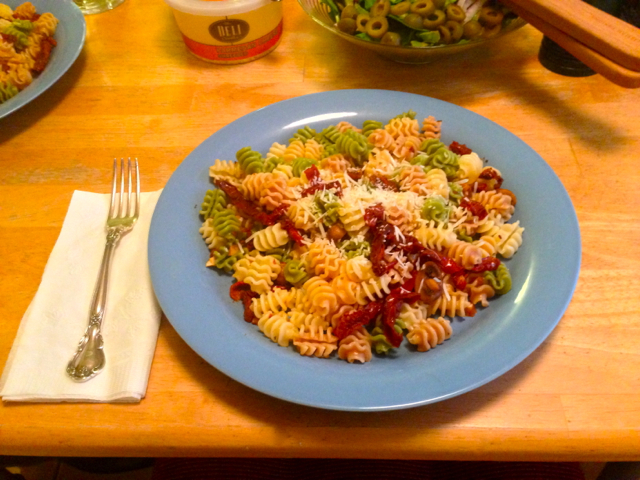 I used about 2/3 of a 12 ounce package of pasta to make two generous servings. This recipe can be easily adjusted to make more servings. Toss the pasta with the sun-dried tomato mixture, and top with shredded and/or grated Parmesan cheese (unless you are vegan). A fresh garden salad goes well with this dish. 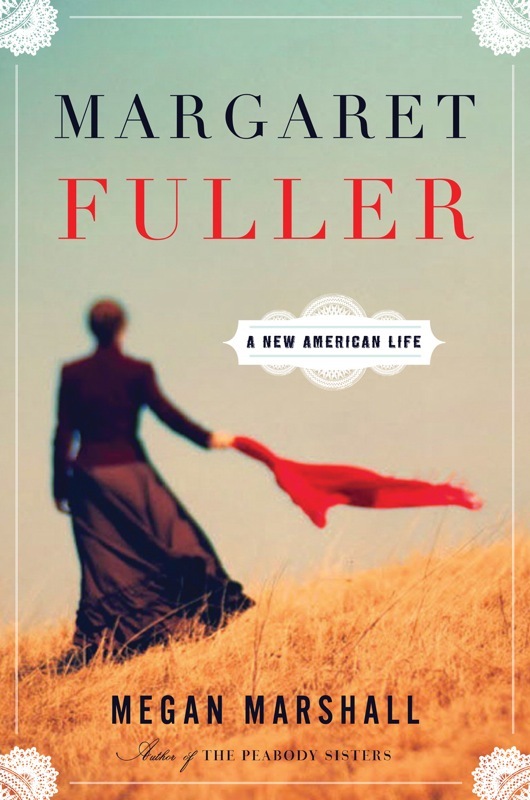 The randomly chosen winner of Margaret Fuller: A New American Life by Megan Marshall is Carol N. Wong. Congratulations, Carol! I think you'll enjoy this biography about Margaret Fuller, who influenced and inspired others, including Virginia Woolf. Thanks to everyone who participated in this book giveaway. I have other giveaways listed on the right side of my blog for those of you interested in winning other books. Please take a look! Happy Tuesday! I welcome your participation in this meme, and your comments. Wow Suko, you are making me hungry! Thanks for the recipe, I've never had Sun-dried Tomatoes. I adore sun dried tomatoes so that sounds divine to me. 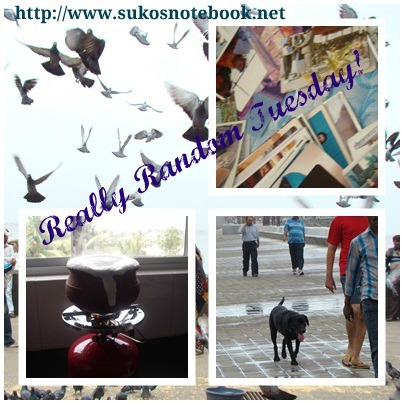 What a wonderful Random Tuesday post Suko! Loved the recipe and the photos! I was just thinking about sun-dried tomatoes and this dish seems like one we would love. Thanks you for sharing it with us. Yum, delicious though could I have mine with extra mushrooms? Good luck Carol and happy reading. Wow, that dish looks really good! I really like sun dried tomatoes. I am so excited!! I am really looking forward to reading the Margaret Fuller book!!! I am vegetarian and the pictures of the dish look great! I'm just reading a V.Woolf's novel and try to be a vegeterian : two good reasons to like a lot your post... But I think we don't have in France this kind of pasta : no problem, we have other ones ! How interesting about Woolf and food writing. She would have loved your recipe, as I do! That pasta sure looks yummy!!! I wonder if my kids would be up for that one...I think my daughter definitely would like the tomatoes :) Thanks for sharing!! I love sun-dried tomatoes but not cooked. I've tried this recipe before only to discover that I preferred my sun-dried tomatoes dry. Oh well! They are delicious to me, either way! Thanks for stopping by, Laura. Yum! I haven't made anything with sun-dried tomatoes in years. Will have to give this a try. As for Woolf, she knew an awful lot about food (think of the description of the dinner in To the Lighthouse. But yes, if she were with us today, she'd be a vegetarian. Fuller book sounds fascinating, too. Yes, Virginia Woolf does focus on food in her novels. Thanks very much for stopping by, ds! I love pasta done in any way possible so this looks positively yummy to me! It is interesting to wonder how people would have eaten today isn't it. Meat and meat dishes were so prominent then compared to now. Thank you all for the comments! Tonight I'm making Jerusalem artichoke angel hair pasta with sun-dried tomatoes and marina sauce. I think I agree with the Virginia Woolf quote! I'm a vegetarian, and I do love food. I always notice when writers discuss or describe food in their novels. I'm hungry just reading this and looking at the picture - it looks tasty! I love sun dried tomatoes as well. It is fun to read about food. I just got out my sad journal that I hadn't written in since 2004. Ben and I had a laugh about the fabulous food I used to make and how late we used to eat. I still cook good (I think), but its a lot more basic and repetitive now. The kids do not eat meals I experiment on. When will they be old enough to try something new? Even if its been a year for seasonal dishes, they refuse to eat them. Sad sigh.